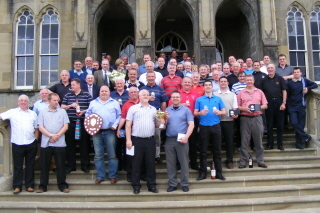 The Provincial Grand Lodge of Stirlingshire Annual Golf Competition was played on Sunday 9th May at Ross Priory Golf Course, Gartocharn, in conditions that could not have been bettered. The glorious springtime weather, which has become a feature of this event, was complemented by the condition of the course and the excellent fare provided by Ross Priory staff. They say the Golf was not too bad either. The winners, as listed below, were presented their awards by Mrs Dorcas McKenzie in her last official engagement. Special awards were given as per usual to anyone achieving, or not, something out of the ordinary. Iain MacDonald, Lodge Zetland No 391, was given his special award for hitting his tee shot off the 1st tee, the ball then hit the SECOND tree at the entrance to the CARPARK, and bounced back onto the 1st Fairway. John.B.Muir, Lodge Dolphin No 911, got his for for the shortest drive of the day. This was the very first shot of the day. The ball, being driven off the tee, hit his left ankle, then his right ankle and went 3 inches in front of his tee. Colin Alldritt was awarded the Porridge Club Award. Last year he arrived at Ross Priory and found he had left his shoes in the garage, this year he had reminded himself not to do it again but left his CLUBS behind instead.